Indian Conglomerate Reliance has recently ventured in the smartphone and telecommunication business and is betting big on 4G revolution to drive its business model. Since the soft launch of Reliance Jio services, the company has steadily expanded its distribution retail channel to most towns in India has been pushing its low-priced 4G smartphones in the offline market. 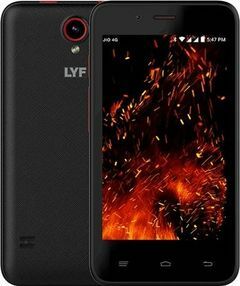 The Lyf Flame 4 is a smartphone priced under rupees 5K to offer 4G services to budget smartphone buyers in India. The phone is powered by a unspecified quad-core 1.5GHz chipset coupled with Mali 400 GPU and 512MB RAM. The phone features a 4-inch WVGA display with 480 x 800 running resolution layered with Asahi Dragontrail Glass protection. The dual SIM smartphone runs on the Android 5.1 Lollipop. It comes with 8GB of internal storage that can be expanded up to 32B via microSD card. The Lyf Flame 4 budget smartphone also bears a 2-megapixel primary camera and a VGA front facing camera. It supports 3.5mm audio jack and FM radio. A micro SIM and a full size SIM can be used in this device. It is available in black and red stripe colors. In terms of connectivity option, it supports 4G LTE, 3G, WiFi 802.11 b/g/n, Bluetooth 4.0 and GPS. it is aided by a 1400mAh. The Reliance Lyf Flame 4 price in India is Rs. 3,999. It is currently available in offline stores. For online availability of Reliance Lyf Flame 4 and its online price in India subscribe to Smartprix alert. Doesn't support google play apps.